Cosmas shows great passion and commitment in his work to rescue injured, orphaned and illegally held primates from across Zambia – all victims of the bushmeat and illegal pet trade. Despite humble beginnings and a general lack of recognition, he has achieved remarkable success and progress in his chosen field. Born in a small rural village his mothercould not afford his secondary education, so he left schoolearly. 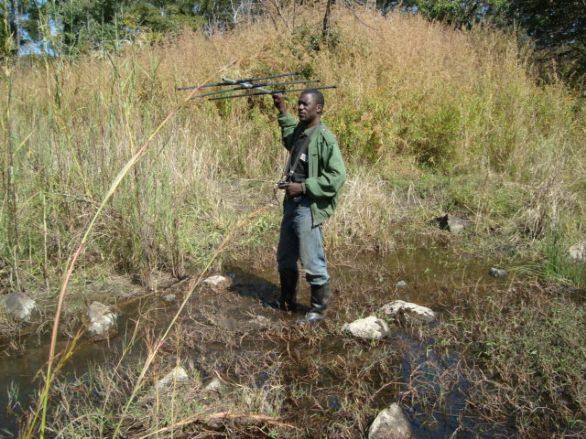 Some of his relatives worked as wildlife scouts within Zambia National Parks and WildlifeServiceswhich fuelled Cosmas’s passion for wildlife from an early age. As a young child he used to rescue and release monkeys that had been trapped and were being stoned by villagers, shruggingoff the derision of his fellow Zambians who had little heart for such primates. Since 2002, Cosmas has worked for the Zambia Primate Project moving through the ranks from cook, camp assistant, field research assistant, field researcher, field manager to now Project Manager, responsible for all of Zambia Primate Project’s operations in Zambia.He has personally developed an exemplary primate release programme based in the Kafue National Park. Whilst yellow baboons and vervet monkeys are not threatened, they are species that are hugely persecuted across Africa. In Zambia, they are the main species targeted by poachers for the commercial bush meat trade, with the orphans then sold into the illegal primate pet trade. Cosmas has rescued and returned to the wild over 500 of these primates, rescuing them from the most harrowing conditions and giving them a secondchance of life back in the wild.He is an unsung hero and serves as a role model to other would-be conservationists. Inspired by Cosmas’s story? Learn about another extraordinary finalist. This award is given to an individual who has been judged to be emerging as a leading conservationist and in recognition of their outstanding contribution to, and considerable success, in their chosen field. The award is sponsored by Land Rover and this year will be presented by Sir David Attenborough. The three finalist will be present at the Awards ceremony, when the winner will be announced and presented with a beautiful trophy created by Tiffany & Co as well as a grant for £20,000. The two runners up each receive a grant of £7,500. Let Cosmas and others like him know that you support them #ForAllTheyDo.